Newtown Residents: Senate Gun Votes 'A Slap In The Face' : It's All Politics Following the Senate's rejection Wednesday of a range of gun control measures, including universal background checks, many in Newtown, Conn., are reacting with surprise and disappointment. Neil Heslin, whose son Jesse was one of those killed, says Wednesday was "a shameful day for Washington." 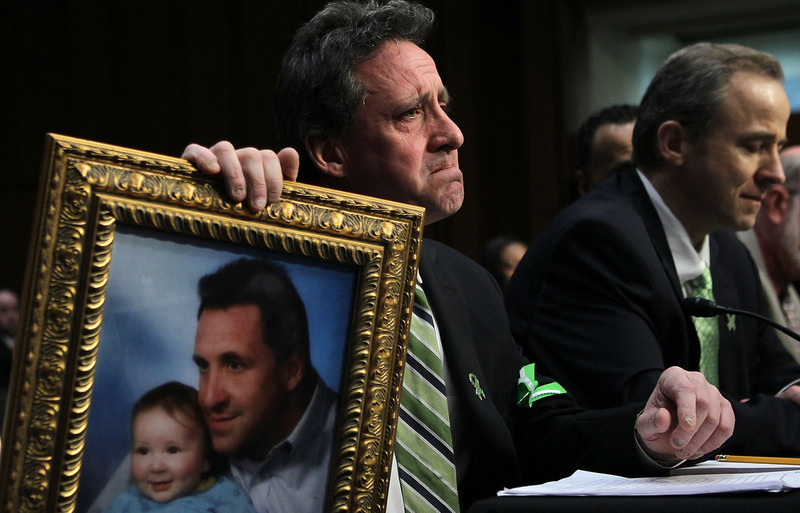 Neil Heslin, father of 6-year-old Sandy Hook Elementary School shooting victim Jesse Lewis, holds a picture of the two of them as he testifies during a hearing before the Senate Judiciary Committee in February. Following the Senate's rejection Wednesday of a range of gun control measures, including universal background checks, many in Newtown, Conn., are reacting with surprise and disappointment. The town is still stricken with grief from the shooting at Sandy Hook Elementary School in December that took the lives of 20 students and six adults. On Thursday morning, Mike Cragin stopped by the Dunkin' Donuts in Newtown with his bulldog, Truman. After the Dec. 14 shootings, Cragin brought Truman down to this Dunkin' Donuts and put up a sign inviting people to hug the bulldog. "Over the course of two days, hundreds of people came and hugged this dog, and then burst back into tears," he recalls. 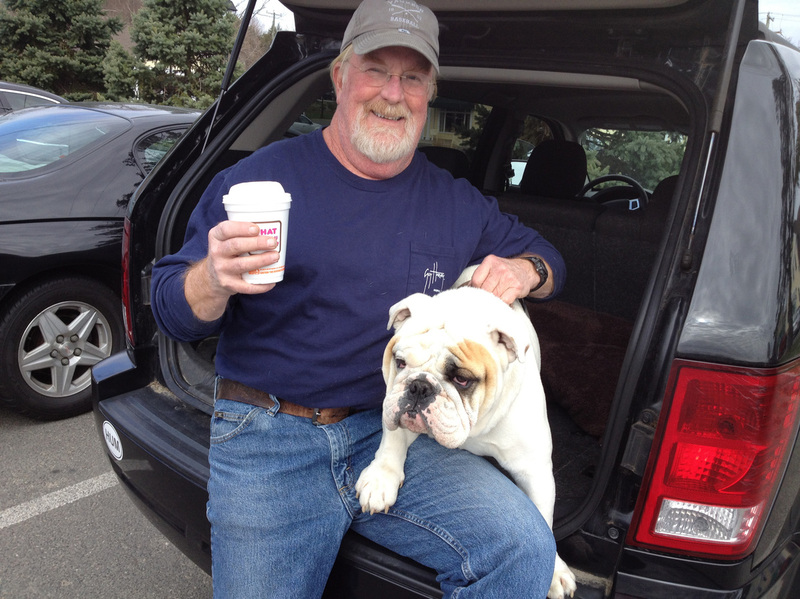 Mike Cragin and his bulldog, Truman, stopped by the Dunkin' Donuts in Newtown, Conn., on Thursday. After the elementary school shooting in December, Cragin came to the same place and put up a sign inviting people to hug his dog. Cragin says he thought the tragedy in Newtown would lead to legislation on guns. "I'm totally stunned. I'm completely stunned," he says. He calls it shocking that politics led to the defeat of the bills. "It just astounds me that it's that corrupt, really, that based on special interest — it's not the will of the people," he says. "I just find it really appalling." Patti Formisano lives in the Sandy Hook neighborhood in Newtown, across the street from one of the children who was killed and about 15 houses down from the shooter's house. She says she doesn't understand why the Senate voted the way it did. "Background checks are just — I mean, it's nothing, it's nothing," she says. "Why wouldn't anybody want that? ... I don't care who you are — you know, except a criminal." Neil Heslin, whose son Jesse was one of those killed, says Wednesday was "a shameful day for Washington." Heslin is still in Washington, D.C., where he's been for the past two weeks, lobbying members of Congress to pass the legislation. "I just think it was a slap in the face for the people of Newtown," he says. Monte Frank of Newtown was part of a team that biked from Sandy Hook to Washington to show its support for the gun control legislation. "It gave me a pretty good indication as to how America felt about these common-sense measures to reduce gun violence," he says, "because all along the way, we met the 90 percent of Americans who favor background checks." Of course, like in the rest of the country, not everyone in Newtown agrees that most of the measures voted on Wednesday are a good idea. The National Shooting Sports Foundation, a trade association for the firearms industry, is headquartered in Newtown. In a written statement, the foundation celebrated the Senate votes, calling the failed amendment that would have instituted a new assault weapons ban and limits on magazine capacity "flawed." But some measures the foundation supported — including strengthening existing background checks — also failed Wednesday. One thing everyone in Newtown seems to agree on is that despite Wednesday's votes, the debate about gun control in this country is not over.